When we first met in the early ’90s, we quickly fell irrevocably in love. 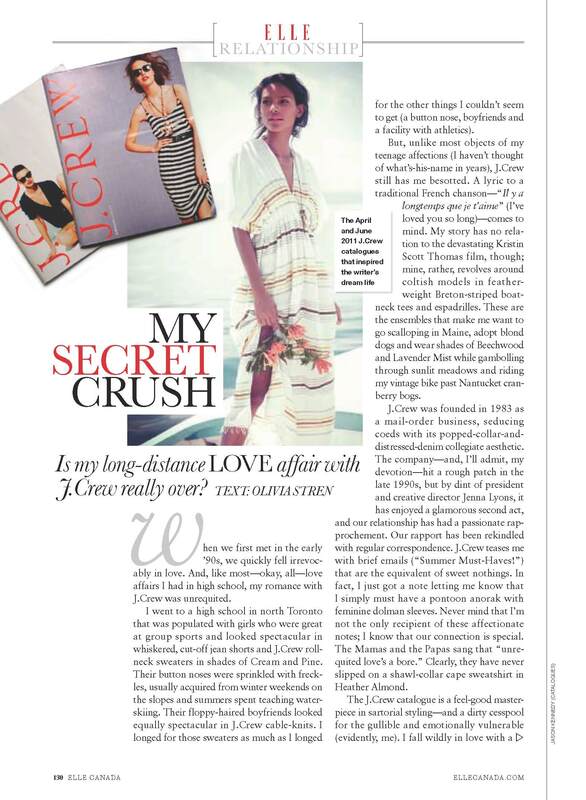 And, like most—okay, all—love affairsI had in high school, my romance with J.Crew was unrequited. I went to a high school in north Toronto that was populated with girls who were great at group sports and looked spectacular in whiskered, cut-off jean shorts and J.Crew rollneck sweaters in shades of Cream and Pine. Their button noses were sprinkled with freckles, usually acquired from winter weekends on the slopes and summers spent teaching waterskiing. 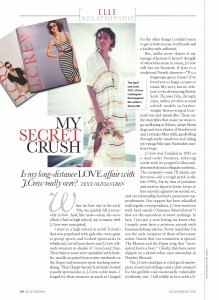 Their floppy-haired boyfriends looked equally spectacular in J.Crew cable-knits. I longed for those sweaters as much as I longed for the other things I couldn’t seem to get (a button nose, boyfriends and a facility with athletics). But, unlike most objects of my teenage affections (I haven’t thought of what’s-his-name in years), J.Crew still has me besotted. A lyric to a traditional French chanson—“Il y a longtemps que je t’aime” (I’ve loved you so long)—comes to mind. My story has no relation to the devastating Kristin Scott Thomas film, though; mine, rather, revolves around coltish models in featherweight Breton-striped boatneck tees and espadrilles. These are the ensembles that make me want to go scalloping in Maine, adopt blond dogs and wear shades of Beechwood and Lavender Mist while gamboling through sunlit meadows and riding my vintage bike past Nantucket cranberry bogs. enim collegiate aesthetic. The company—and, I’ll admit, my devotion—hit a rough patch in the late 1990s, but by dint of president and creative director Jenna Lyons, it has enjoyed a glamorous second act, and our relationship has had a passionate rapprochement. Our rapport has been rekindled with regular correspondence. J.Crew teases me with brief emails (“Summer Must-Haves!”) that are the equivalent of sweet nothings. In fact, I just got a note letting me know that I simply must have a pontoon anorak with feminine dolman sleeves. Never mind that I’m not the only recipient of these affectionate notes; I know that our connection is special. The Mamas and the Papas sang that “unrequited love’s a bore.” Clearly, they have never slipped on a shawl-collar cape sweatshirt in Heather Almond. But, as with so many love affairs, there is a bitter measure of self-deception, fantasy and disappointment. Bikini arrived at my door, and we were a disastrous fit. My love brought out the worst in me, and reality intervened—as did my VISA bill. My euphoria (Crewphoria?) was replaced with an unsavoury cocktail of freefloating anxiety, guilt, insecurity and financial alarm. “It’s not me; it’s Bikini,” I told myself. But thankfully, like Carly Simon, I believe in love. So things didn’t work out with Bikini, but maybe I’d still find happiness with the eyelet schoolboy blazer in Smoky Graphite. Roll the clip: Me, biting casually on a pencil, while Blazer and I are spectacularly productive at the office; me, hair vaguely windswept, and Blazer holidaying in Corsica. Until now, my 20-year relationship with the American clothier has been long distance—arguably adding to its endurance and excitement. But J.Crew is coming to Canada. A 465-square-metre dream (I mean, store) come true opened in Toronto’s Yorkdale Shopping Centre in August. I worry that proximity may enervate our bond—a bit like when that fling you had abroad suddenly lands on your doorstep and he’s not as dishy as you remember. (This, by the way, has never happened to me.) Then again, maybe J.Crew’s move to Canada will bring us closer. Either way, if heartbreak ensues, it’s surely nothing a Roulette clutch in Parsley Sprig can’t cure.